There are sixty plus wine regions in Spain producing a comprehensive array of different wine styles. Improvements in Spanish viticulture and winemaking over the past two decades has lead to a marked improvement in quality across the board. Rias Baixas is on the Atlantic coast just above the border with Portugal. Here Albarino is the favoured variety making Spain's best crisp white wines. The Basque country on the Northern coast where the Pyrenees meet the Atlantic contains three small wine regions Getariako Txakoli, Bizkao Txakoli and Arabako Txakoli. The local grape varieties Hondarribi Zuri and Hondarribi Beltza and Folle Blanche are used to make refreshing low alcohol but highly acidic white wines. Also in the North of Spain is the wine region of Navarra, named after the province known in English as Navarre. It is overshadowed by Rioja, it's southern neighbour. Garnacha is the traditional variety used here but Tempranillo is increasingly used. Red and rose wines are made with these varieties and some white wines are produced from Macabeo and Chardonnay. The Rioja region straddles the Ebro River in the northern part of Spain's Meseta or central tableland. It is Spain's leading wine region producing mainly red wines from the Tempranillo grape. Ribera del Duero is south of the Rioja along the Duero River. Again the main grape variety used is Tempranillo, here known as Tinto Fino. Other red wine varieties include Garnacha (Grenache) and Cabernet Sauvignon which are minor blending partners to the Tempranillo. This region boasts Spain's most expensive red wine - Vega Sicilia Unico. Penedes to the south-west of Barcelona is best known for the production of Cava, Spain's sparkling wine. Still white wines made from Chardonnay and other varieties as well as red and rose wines, often made from Cabernet Sauvignon are also produced here. In the South of Spain is Jerez in sun kissed Andalucia is world famous for its sherry. These beautiful wines are not the only treasure to be found here. Jerez also lays claim to being the originator of tapas, the delightful small smacks that have taken the world by storm, and an indispensible accompaniment to sherry. These are just a few of the sixty or so Spanish wine regions. All are undergoing modernisation and improvements as they compete in the world market. You may need to fill up the tank before returning a rental car at this airport following the "full out/ full return" fuel policy. In this case and in your interest, there is Galp petrol station opposite the new terminal building. 1. 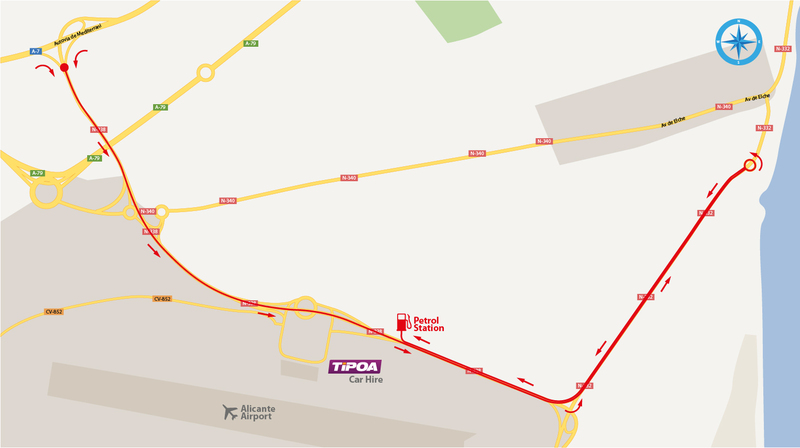 If you head to the airport from the A7 highway, take the exit "aeropuerto" through the road N338. Then in the first roundabout take the road N332 heading to Alicante. You will be able to turn back in another roundabout and then reach the N338 road back again to the airport and the petrol station. 2. If you already drive on the N332 from any direction and heading the airport, just take the exit to the airport through the N338.